Storyboarding is an extremely important and useful tool when creating films, games, animations, concepts, short stories and advertising. It is one of the first things done when creating anything moving or animated. It is basically a group of static illustrations or images put together in an order that shows how the scene in a movie or something will run its course. The sort of information that needs to be shown in storyboards is stuff like what direction a person will be moving and stuff that can be easily forgotten if not drawn down, this is done by the images and accompanying notes. Doing this allows you to organize the scene before actually shooting it or creating it, you can see if there will be any problems and fix them before you start and can save a lot of time that would be wasted otherwise. 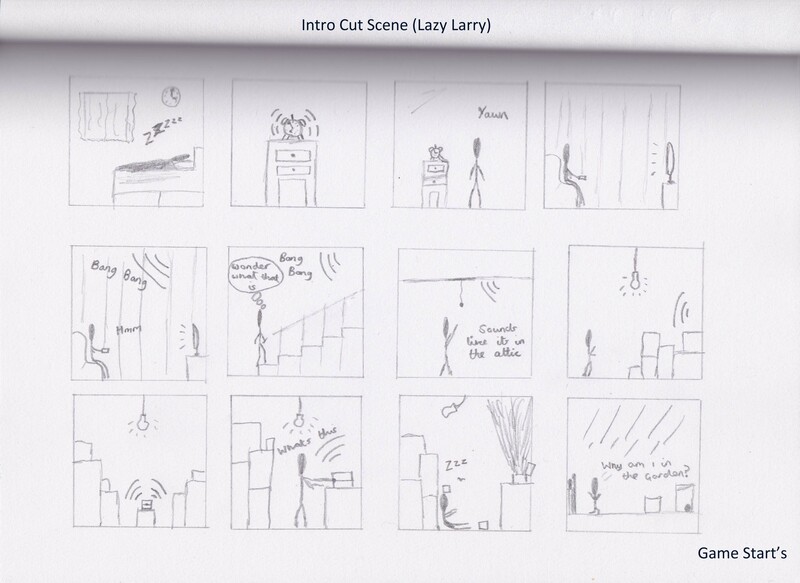 This is a storyboard i created in semester 1 for my casual game ‘Lazy Larry’ and i found it useful to show how i would want my initial game cut scene to look like. I found this on YouTube and it shows how close the final version of the movie can look to the storyboards, there isn’t really too much difference. So this show’s how useful it is in creating animated scene’s and how much time and effort is put into creating these storyboards. 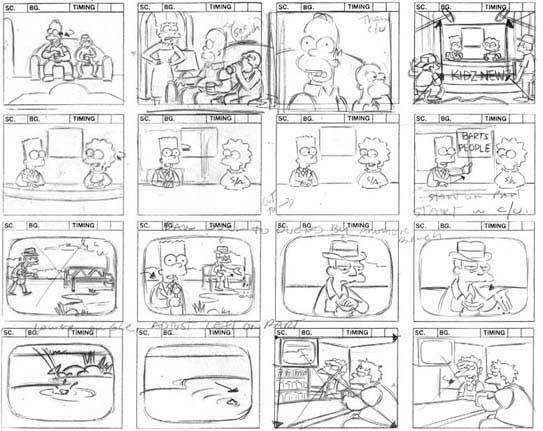 This is a storyboard from the Simpsons to show what a professional storyboard looks like, this one doesn’t have any notes with it though and shows that storyboards don’t have to have the most amazing drawings. I think the main difference between traditional illustration and storyboarding is that in traditional illustration the drawings will be very detailed and very pleasing on the eye, for example game concept art shows what a game looks like but in an artistic way and does not to show what actually happens in the game. whereas storyboards aren’t all about the beauty and detail and more about telling the story and what happens, so in the example of a game it will show what happens and what the player does in a cut scene in little detail but enough to have a direction. ← UV Unwrapped Basic Primitives..